June 19, 2008: Many Hudson and Marlborough residents who are neighbors to the trail have upgraded their backyards and gardens since the trail opened in 2005. The ARRT has selected Ivo Matias as the winner of the first annual ARRT Best Garden award. More details are here. May 6, 2008: The Stow Town meeting voted overwhelming in favor of the last piece of the 'Track Road' easement purchase after much discussion. A counter amendment to prevent paving the future bike trail (in Stow) was defeated. When combined with the section acquired in 2004, the town now has access to the entire 1.7 miles between Sudbury Road and the Stow-Maynard town line, the longest uninterupted segment in the 12.5 mile, five-community rail trail. The next step is for Stow and the Commonwealth to apply for the funding to design and build this section of the trail. Febuary 15, 2008: Patrick Administration Awards Smart Growth/Smart Energy Grant to Stow. Seven grant recipients announced today include Stow; $19,500 for appraisals and engineering at the Lundy Property, which includes cluster affordable housing, land conservation and a bypass for the Assabet River Rail Trail. A map of the property is here. 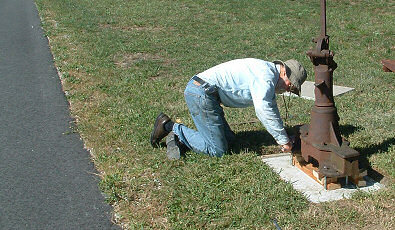 September 29, 2007: ARRT volunteers and the Hudson DPW have started to install a 1906 RR switch next to the Hudson caboose. It will be the first piece at 'ARRT Park'. Also planned are 4 interpretive panels and a RR sign. More pictures are in the volunteers gallery.